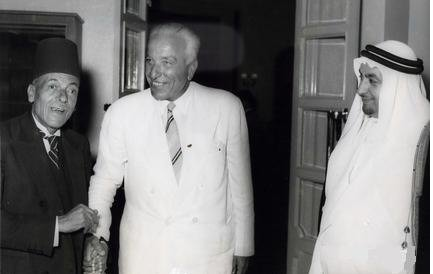 Abdallah Machnouk (center). Image source. It’s been a smelly month in Lebanon. For the past few weeks, thousands of citizens have been taking the streets asking for solutions to the garbage crisis and for the resignation of the environment minister Mohamad Machnouk, among other things. Earlier this week, activists held a sit-in inside the ministry, and on the 3rd of September, some Lebanese started a hunger strike in front of the environment ministry. Until last month, Mohamad Machnouk was arguably one of the least known Lebanese ministers, and for obvious reasons: He’s a pro-Salam minister in the cabinet (so in a way or another, not directly M14 and definitely not M8) and serves in a ministry that was considered to be (at least by politicians) one of the least important ministries in the cabinet. He was also never a member of the parliament. But his father was. In the 1950s Abdallah Machnouk was a prominent journalist from the opposition and had a role alongside Saeb Salam in the 1958 uprising against Chamoun. Abdallah Machnouk subsequently ran in the 1960 parliamentary elections and won a seat in Beirut that he held till 1964. Salam would eventually bring him into two of his cabinets, first as minister of municipalities in 1960, then as interior and press minister in 1961. Le leader Sunnite de Beyrouth a dirigé deux gouvernements sous le ‘Ahd de Fouad Chehab: Le cabinet des dix-huit, du 1er aout 1960 au 20 mai 1961, et un cabinet restreint a huit membres du 20 Mai au 23 octobre 1961. A deux reprises pourtant, lors du deuxième gouvernement Salam d’une durée de 156 jours, le général doit arbitrer des conflits qui opposent son président du conseil à d’autres ministres. La tension s’envenime quand le chef de l’Etat prend des décisions qui contrarient son chef de gouvernement. La première grande crise ministérielle éclate le 13 septembre 1961. Saeb Salam s’oppose à la décision d’indemnisation (à hauteur de 500 000 livres libanaises) attribuée à Sami al-Solh, l’ancien premier ministre de Camille Chamoun, pour la destruction de sa maison lors des évènements de 1958. Comme ministre des Finances, Pierre Gemayel est chargé de verser l’indemnisation prévue dès 1958 par le cabinet Karamé de réconciliation nationale, et confirmée par le conseil d’Etat et la Cour des comptes. Pierre Gemayel indique qu’il n’est pas disposé à revenir sur cette décision. Afin de protester contre cette mesure, Saeb Salam suivi d’Abdallah Machnouk, le ministre de l’intérieur, offrent brusquement leur démission au chef de l’Etat. L’autorité du général finit cette fois-ci par renoncer Salam, mais le principe de l’indemnisation à Sami al-Solh est finalement confirmé. In case you don’t know French (sorry, couldn’t find anything in English), it’s about the Prime Minister Saeb Salam (father of the current Prime Minister Tammam Salam) and his interior minister Abdallah Machnouk (father of the minister Mohamad Machnouk) resigning on the 13th of September 1961 as part of a political maneuver following a political feud in the cabinet (Gemayel wanted to give ex-PM Sami Solh – Saeb Salam’s Beiruti rival – 500 000 LBP as a compensation for his house that was destroyed in the 1958 events, and Saeb Salam didn’t want to) . The irony here is crystal clear: Two Lebanese politicians in the cabinet are willing to resign for political gains, while their sons, exactly 54 years later, refuse to give concessions/resign even when 100 000 Lebanese protest and ask them to. If those 54 years have taught us anything, it’s that the price of a politician’s house is more likely to bring a government down than the idea of a garbage belt surrounding Beirut.